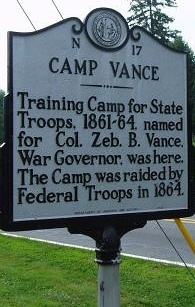 Training Camp for Civil War State Troops, 1861-64, named for Governor Zebulon B. Vance. The Camp was raided by Federal Troops in 1864. Established in August 1863, Camp Vance served as a post for Captain James McRae’s battalion of North Carolina cavalry, and as a training camp for men of the junior reserves from western North Carolina. The camp was along the unfinished Western North Carolina Railroad, roughly four miles east of Morganton. Named for North Carolina governor Zebulon B. Vance the post was one of three camps named for him. The others were an 1861 establishment in Buncombe County that served as the training ground of the 29th North Carolina Troops and a temporary facility near Goldsboro that served Confederate forces guarding the approaches to that city. McRae’s battalion, authorized by an order from Confederate Secretary of War James A. Seddon, was to be used as an enforcer of the Confederate conscription acts in western North Carolina. The majority of McRae’s men were moved to Asheville by early 1864. The junior reserve regiments, as well as a series of senior reserve counterparts, were authorized in late 1863. Junior regiments consisted of boys aged 17, while the senior battalions were comprised men typically over the age of 45. The law authorizing such units stated that the reserves would not “be required to perform service out of the State.” All members of the junior reserves were to be transferred to regular Confederate army units upon their eighteenth birthday. On June 12, 1864, while members of the junior reserve garrison at Camp Vance were still awaiting to be issued weapons, Colonel George W. Kirk, commander of the 3rd North Carolina Mounted Infantry, a Union regiment, led 175 of his troopers, armed with Spencer rifles in a raid into North Carolina from Morristown, Tennessee. He arrived at the outskirts of Camp Vance on the morning of June 28, 1864. The unarmed teenagers were no match for Kirk’s men. Union soldiers approached with an offer that, upon immediate surrender, all prisoners would be paroled and no destruction of personal property would take place. As the camp commander, Major Jesse McLean, was absent, Lieutenants Walter Bullock and Edward F. Hanks conceded. Kirk broke the agreement, placed the young men under arrest as prisoners of war, burned the camp, and then proceeded to destroy the nearby railroad depot, a locomotive, and four train cars. As word of Confederate reinforcements arriving from Salisbury and Burke County came in, Kirk wisely chose to retreat back across the mountains. Local home guard and Confederate cavalry did manage to attack the column near Winding Stairs Road, but were unable to stop their withdrawal into Tennessee with approximately half the prisoners, the others having managed to escape. After the attack, Confederate forces rebuilt Camp Vance and, for the next two months, it served as a recruiting and training depot for other detachments of junior reserves. In late July several companies of senior reserves were ordered to Camp Vance but in early August, faced with increasing threats of Union activity in the area, Confederate authorities ordered that the facility be closed and that all western junior reserve training be completed at Camp Stokes, near Greensboro.